we hope that you like winter Ice Creams so we prepared something very special and interesting for you. We all now that Continuous integration and Delivery is very important and how much Dev…Operations are present in developing and delivery process. 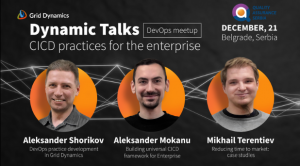 So we decided to organize a DevOps event in partnership with Grid Dynamics. Their engineers will present us how they deal with CI/CD and share best practices. The event will be organized on Friday, December 21st at 6 pm in ICT Hub. Be connected, enjoy our event!